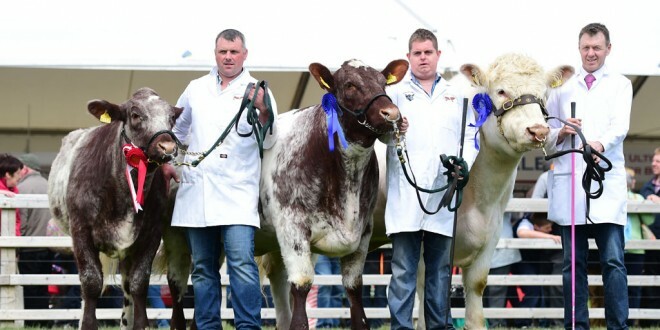 KINVARA beef shorthorn breeder, Tom Staunton, enjoyed tremendous success at the recent Balmoral Show in Northern Ireland. With his team of three animals he took the Beef Shorthorn Reserve Champion with his eye catching Carmba Rothes Hottie. It wasn’t Hottie’s debut, as she was awarded the All-Ireland Beef Shorthorn Heifer calf in Strokestown, CountyRoscommon last September. Tom’s bull, Bushypark Ultra took second prize in the senior bull class and his maiden heifer, Graigue Hilltop took second prize in her class also, at Balmoral. Tom was commended for the huge effort he puts into exhibiting his beef shorthorn cattle and putting Irish beef shorthorn genetics on the international stage.